Some people love them. Some people hate them. Let’s talk about pollinators. Pollinators are insects that roam from flower to flower collecting pollen from each stamen. Our main species of pollinator is the bee, with our country being home to 98 different species. In Ireland alone, there are 20 kinds of wild bumblebee, 77 wild solitary bee specimens and only one type of farmed honey bee. Research from the national biodiversity data centre has found that “one third of our 97 wild bee species are threatened with extinction in Ireland”. The research also revealed that there are declines in the numbers of honeybees on our shores. This is due to drastic declines in the availability of natural nesting areas and a lack of year-round food sources. Unlike the honey bee living in raised hives, the bumblebees nest on the ground in areas with long grass or suitable vegetation. The solitary bees can burrow underground to nest, or create a chamber in holes found on pieces of wood. Undisturbed hedgerows are the ideal place for bees to nest, as they provide safety and access to food for longer periods of the year. However, many of these hedgerows suffer from a lack of maintenance, which contributes to a lower plant diversity. These are not just issues for rural areas, they’re issues for urban localities too. This is where the All-Ireland Pollinator Plan comes into play. The pollinator plan was established in order to help people from areas of Ireland combat the pollinator decline. It comprises of an online booklet which includes cost-effective tips for communities so they can create a more balanced environment on a local level. There are 81 actions we can undertake in groups or individually. For example, simple steps like reducing the frequency of lawn mowing, sowing wildflower seeds and incorporating more flowering shrubs and trees in your garden can have a high impact on improving biodiversity. If wildflowers aren’t your thing, another wonderful way you can help is by creating a “bee hotel”. This would be a great project to do with the kids in the family. To start, you’ll need either hollow bamboo or reeds to create small tube-like structures for the bees to nest in. You’ll also need some wire or string to attach your grouping of the bamboo together, packed tightly for security. You’ll also need plastic piping or a piece of wood in a similar shape, to secure around the tied bunch of bamboo. This will shield the bees from cross-winds and predators. Lastly, make sure you have the bamboo shoots facing outward and close off the back of your bee hotel for extra protection. Another optional attachment you could add to your bee hotel is a sloping roof on top of it to divert rain. It would definitely add to the wow factor! Great effort from local Tidy Towns. The Donnybrook Tidy Towns committee have made a positive change in recent years by making room for urban pollinators. Their Buzz Shelter, located next to Old Wesley, has opened up an area of disused concrete ground, converting it into a wildflower oasis. Some of the flowers included are fuchsias, doronicum (of the sunflower family) and garden mint and they have included ornamental grass for bee pit stops. Their hopes are to encourage more pollinators back to the village and to conserve the species. RITE have been in touch with NewsFour and have expressed interest in taking part in the local pollinator plan. They have spoken about their plans to create a wonderful wildflower meadow in the Ringsend / Irishtown area and the committee have already created bee hotels to support pollinators in the locality. Along with this, they regularly share informative videos and tips on their facebook group to spread awareness. Sandymount has beautiful public planting displays as stop-off points for pollinators, but are not taking part in extra pollinator activities this year. Speaking to the STTCA, they have said that they will possibly participate next year. In a joint research study published last year, Jack Hassett of Limerick IT and Keith Browne of NUIG noted that native Irish “black bee” numbers were more plentiful than previously thought. Formerly, there were fears that the Irish bee had been driven to extinction due to disease, parasites like the varroa mite and through hybridisation. However, through DNA testing they found that the genus Apis mellifera mellifera were not wiped out from Ireland, in fact it found that we have the purest lineage of this breed of bee in Europe.“Data from 412 honey bees from 80 sampling sites across 24 counties shows the existence of a highly pure breeding population throughout the island”.This is a huge discovery that will aid in gathering clearer data about our bees. NewsFour got in touch with Jack for further comment on his study and he said, “Honey bees are a critical natural pollinator worth billions to the global economy and they need to be preserved. With Ireland being home to such a pure native population of honey bee, it is therefore imperative that this natural resource be protected”. A recent Eco Eye television programme has highlighted ways in which localities are improving urban environments for pollinators. In the show, Dr. Tomás Murray of the National Biodiversity Data Centre stated that the Bumblebee Monitoring Scheme has made a substantial positive impact on their scope of information on bumblebees in Ireland. The scheme involves volunteers going out once a month as citizen scientists gathering data and noting the amount of bumblebees they see on a one to two kilometre area walk. Dr. Murray also revealed that the NBDC now have six years worth of data collected on bumblebees, thanks to citizen scientists. 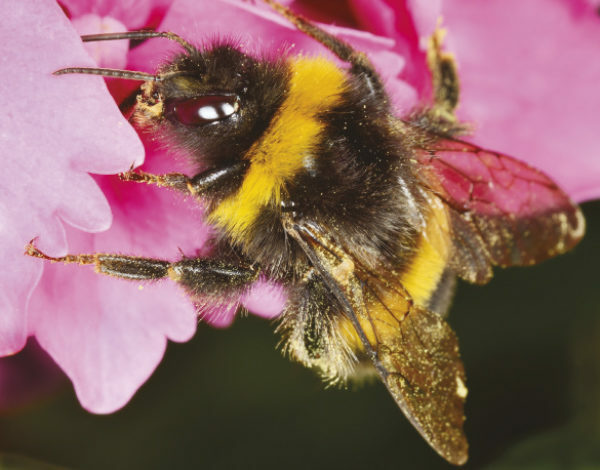 Unfortunately, the information gathered shows a 14% decline in bumblebees over the six years, meaning a consistent effort needs to be made on all fronts to combat this. There are many types of insects that pollinate but realistically, bees are the most efficient. In an article published on agriland.ie, Prof. Neil Rowan, director of the Bioscience Research Institute in AIT commented on the matter: “87 of the main 124 crops used directly for human consumption require or benefit from animal pollination annually. Pollinator services contribute €153 billion and €54 million to the global and Irish economies respectively”. Despite efforts being made, globally, the numbers of pollinators have declined. Recent studies published by Science Direct states that up to 40% of the world’s insect population is threatened with extinction. They state that “trends confirm that the sixth major extinction event is profoundly impacting life forms on our planet”. This evidence affirms that more entomofauna conservation measures need to be carried out. If bees disappear, up to one third of our food crops could also disappear, which would devastate communities worldwide. We’ve made a good start but, we need to greatly increase our attempts on an individual level. If we do so, momentum will gather and we will be ensuring a brighter future of the next generation.